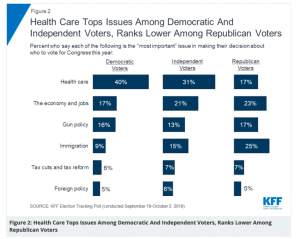 Healthcare was the top issue for Independents (and Democrats) before the 2018 midterms. Notice the emphasis on “Independents”. Dems are going to vote blue, Republicans will vote red, so the 2020 election is going to be decided – like most elections – by independent voters. You can expect every Democratic candidate to hammer away on healthcare in language that worked well last fall. 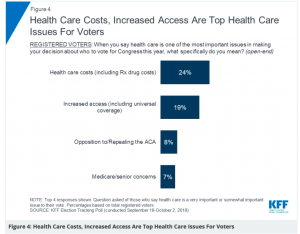 And they will be focusing on costs and access, issues top-of-mind for voters concerned about healthcare. There’s a busload of Democrats who’ve announced they’re going to run for President in 2020, and it looks like the bus is going to be standing room only when Biden and perhaps others announce. Pretty much every of the 354 announced Democratic presidential candidates have signed on to some form of Medicare for All; while I’d argue most haven’t demonstrated any real grasp of the details, the issue is clearly a winning one. Meanwhile, the President has released a budget calling for a $2.3 trillion cut to Medicaid and Medicare. You may recall that then-President Obama called for many of the same changes to Medicare that Trump is hawking now – primarily reducing reimbursement for hospital-based providers. Kudos to whoever put this language into the latest budget – it made sense then, and it makes sense now. BUT – while Dems will be talking about protecting Medicare and Medicaid (which pays for most nursing home care than any other payer), Republicans will be trying to convince healthcare voters that slashing $2.3 trillion from their Medicare and Medicaid is the right answer. The GOP may figure out how to get seniors and others to support slashing their healthcare – a feat that is possible as Republicans are way better at messaging that Democrats. Democrats may be able to stick to their message – as they did to telling effect in the 2018 mid-terms. If they do, and if they win the White House and Senate, the first thing they will do is pass Medicare for Some legislation. The major candidates are all talking about doing big things, they need to deliver big results early, and healthcare was – and is – a winning issue. For healthcare, 2020 will be the most consequential election ever.